BBC Hereford & Worcester looks at Worcester Wolves' win in the British Basketball League Play-off final at Wembley Arena on Sunday. 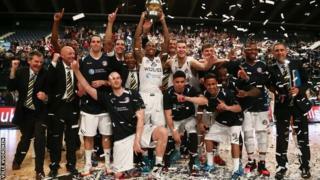 The Wolves won their first Play-off title by beating Newcastle Eagles 90-78. It capped a memorable season for Paul James' side, who won their first piece of silverware in March, beating Glasgow in the BBL Trophy final.